Ice is water, frozen into a solid state. Depending on the presence of impurities such as particles of soil or bubbles of air, it can appear transparent or a more or less opaque bluish-white color. Molecules are constantly moving because they have energy. In a liquid form, water molecules have more energy than in a solid – they move around quickly, essentially bouncing off of one another. As the liquid cools down, the amount of potential energy is reduced and the molecules start to move slower. When the water temperature reaches around 0° Celsius (32° Fahrenheit), the molecules stick together and form a solid – ice. Even in this solid stage, the molecules are still moving – we just can’t see it. There is one more thing needed for water to turn into ice – a crystal-seed. This is a small impurity from which an ice crystal will grow. The impurity may be another particle in the water, or it may be caused by the container that holds the water. This is why not all water freezes at 0°C (32° F). Under some conditions, water can get as cold as -40 °C (-40 °F) – a process called super cooling. This occurs in completely pure water and usually in a very smooth container. Most liquids have a quite simple behavior when they are cooled: they shrink. Water is one of the few exceptions to this behavior. When liquid water is cooled, it contracts like one would expect until a temperature of approximately 4° C (39.2 °F) is reached. After that, it expands slightly until it reaches the freezing point, and then when it freezes it expands by approximately 9%. At temperatures below 0 °C (32 °F), water vapour develops into frost at ground level and snowflakes in clouds. Below the same temperature, liquid water forms a solid, as, for example, hail, glaciers, icebergs, and sea ice, along with ice produced commercially or in household refrigerators. Some snowflakes are made of a single ice crystal while other, more elaborate, snowflakes are made of as many as 200 ice crystals fused together. Glaciers require very specific climatic conditions. They begin to form when snow remains in the same area year-round, where enough snow accumulates to transform into ice. Each year, new layers of snow bury and compress the previous layers. As more and more snow piles up over the years, the weight of the snow on top starts to compress the snow on the bottom. This compression turns the snow to ice. For most glaciers, this process takes more than a hundred years. Ocean water freezes just like freshwater, but at lower temperatures. Fresh water freezes at 0 °C (32 °F) but seawater freezes at about -2°C (28.4 °F, because of the salt in it. When seawater freezes, however, the ice contains very little salt because only the water part freezes. It can be melted down to use as drinking water. To people living in warm climates, all ice looks the same. But if you live day-in and day-out on sea ice, like the Inupiaq people of Alaska, you would find that there are many kinds of ice, all distinct. In fact, the Inupiaq have more than 100 names for different kinds of ice. Ice is used in a variety of ways, including cooling, winter sports and ice sculpture. The ice trade, also known as the frozen water trade, was a 19th-century industry, centering on the east coast of the United States and Norway, involving the large-scale harvesting, transport and sale of natural ice for domestic consumption and commercial purposes. At its peak at the end of the 19th century, the U.S. ice trade employed an estimated 90,000 people in an industry capitalised at $28 million (about $660 million in tobay terms). Dry ice is the solid form of carbon dioxide. It is used primarily as a cooling agent. Dry ice is extremely cold! -78.5 °C or -109.3 °F; Skin contact kills the cells, giving you a dry ice burn. It only takes a couple of seconds to get burned, so it’s best to use tongs or gloves when handling dry ice. Its advantages include lower temperature than that of water ice and not leaving any residue (other than incidental frost from moisture in the atmosphere). 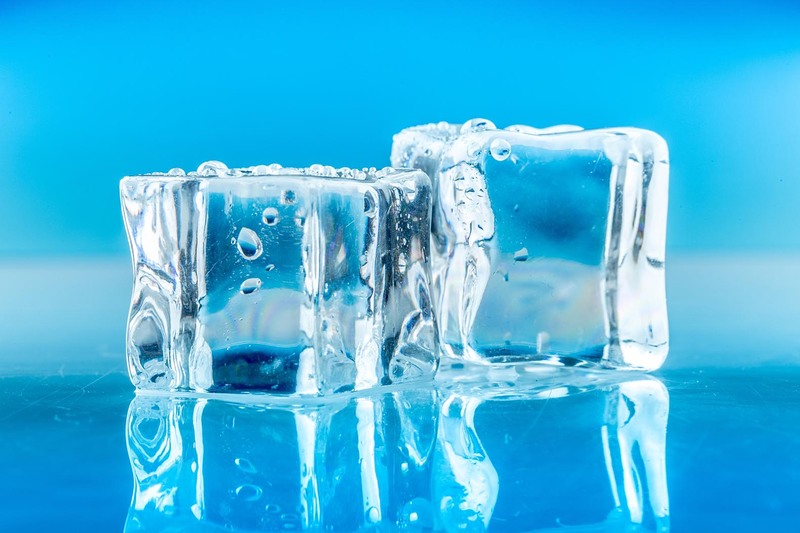 Hot water freezes faster than cold water. While this phenomenon has been known for centuries, and was described by Aristotle, Bacon, and Descartes, it was not introduced to the modern scientific community until 1969, by a Tanzanian high school pupil named Mpemba, who in 1963, proved it by repeatedly demonstrating that a hot ice-cream mixture set more quickly than cold. associated with special or extravagant events because of their limited lifetime. There are several ice festivals held around the world, hosting competitions of ice sculpture carving. The Icehotel is a hotel rebuilt each year with snow and ice in the village of Jukkasjärvi, in northern Sweden, about 17 kilometers (11 miles) from Kiruna. It is the world’s first ice hotel. After its first opening in 1990, the hotel has been rebuilt each year from December to April. The hotel, including the chairs and beds, is constructed from snow and ice blocks taken from the nearby Torne River. Artists are invited to create different rooms and decorations made by ice. Besides bedrooms, there is a bar, with glasses made of ice and an ice chapel that is popular with marrying couples. The smallest piece of ice was created by Roger Miller and Klaus Nauta of the University of North Carolina in 1999. Consisting of just six water molecules arranged in a hexagon, the ice crystal is the smallest theoretically possible, as a minimum of six molecules are required for the formation of ice. For comparison, the average drop of water contains around 100,000,000,000,000,000,000 molecules of water. The greatest recorded thickness of ice is 4,780 m (15,682 ft; 2.97 miles), as measured by radio echo soundings from a US Antarctic research aircraft at 69ø56’17. In addition, on 4 January 1975, a team of seismologists measured the depth of ice in Wilkes Land, in eastern Antarctica, to be 4,776 m (15,669 ft; 2.96 miles) deep. The oldest continuous ice core covers 740,000 years of climate history. It measures 3,139 m (10,298 ft) in length and is 10 cm (4 in) in diameter. It was drilled at Dome C, Antarctica by the ten-nation EPICA (European Project for Ice Coring in Antarctica) and announced on 9 June 2004. Presently, 10 percent of land area on Earth is covered with glacial ice, including glaciers, ice caps, and the ice sheets of Greenland and Antarctica. There have been at least five major ice ages in the earth’s past (the Huronian, Cryogenian, Andean-Saharan, Karoo Ice Age and the Quaternary glaciation). In the Solar System, ice is abundant and occurs naturally from as close to the Sun as Mercury to as far away as the Oort cloud objects. Beyond the Solar System, it occurs as interstellar ice.